If you have any questions or want to enquire about dates, use our form to contact Vincent, Christine & Jean-Louis Martin or see their website for more information. The night view of twinkling Beaune, five minutes down the hill, is glorious. Jean-Louis loves sharing ‘his’ Burgundy: the making of the elegant vintages, the best Burgundian chefs, great Romanesque art. All this by bike, horseback, jeep or hot-air balloon. The Martin family – Jean-Louis and Christine now joined by son Vincent – run three wonderful houses, each surrounded by mature trees and a terraced garden enlivened by Vincent’s wife Jurga’s sculpted figures. The modern, multi-levelled main house has five large and lovely bedrooms while the stone cottage, for B&B or self-catering, is traditional, the third house being more independent. The noble old beams and rosy tommette floors frame a fine new, pale, contemporary look warmed with stylish lighting, crisp linen and polished country pieces (including winegrowers’ chairs). The honeymoon suite has a private piece of garden. It’s bliss to relax on the main terrace and gaze across vineyards to the ramparts of old Beaune. Down a wildflower path is a family-run restaurant. Minimum stay: 2 nights. 2 nights on weekdays. 2 nights at weekends. 2 nights in high season. Christmas, 2 January - 10 February. Breakfast available for self-catering stays: adult, €15 ; children under 10, €10. Picnic available. Restaurant 400m. Additional charge for breakfast in self-catering option: adult, €15 ; children under 10, €10. 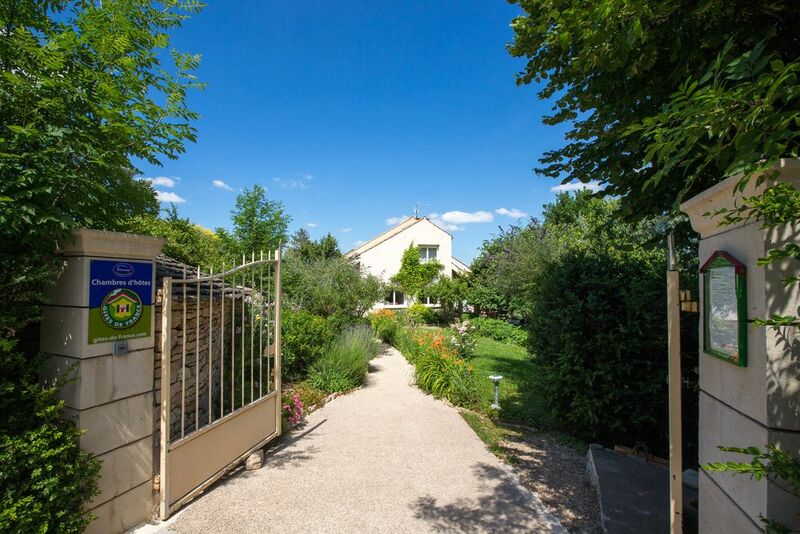 Exquisite house, peace above Beaune, charming, helpful hosts. Visit !! We would love to take you on a special vineyard tours and help you travel like a local, taking narrow vineyard roads and visiting charming villages and old cellars. It's the best way to meet welcoming winemakers, taste great wines and have a great time. Jurga is a sculptor and her sculptures are all around the garden, in the house and underground in the grotto. The are really so charming and alive that you expect them to move at anytime! Digging the grotto under the house was a very exciting family story for over 20 years. No worries, we won't ask you to help us digging, it's now a special wine cellar to explore and relax in the jacuzzi. My mother Christine really has green hands, the multi level garden is so full of flowers and butterflies. You will see birds and squirrels. La Terre d'Or is a romantic place to slow down and relax on the terrace, in the gardens, by the pool or in the surprising jacuzzi. It's so quiet and charming. In winter, have a glass of wine by the fireplace. Depending on your interests, we can suggest a daily itinerary with cultural visits and tastings: not only wine but the very best chocolate, mustard, truffle and home made jam! You want to bike or to walk throught the vineyards? We will help you a lot.